Calvin: (I am AGA 12k as of this posting.) This is a general joseki choice or fuseki question. In the following game I am white. The moves up to are normal, although I think could also be at a though that would lead to another game. When I reviewed this game later, I thought maybe was a bit too much and that a wedge around b or c would be sufficient to disrput black's potential to make a double wing, but maybe that's a bit slow. In any case, what should white do now? If white invades at d, black's black at e works well with . Since black has a low stone in the upper left, I figured jumping at f is good because then if black plays at g I can press at h and put black into a low position on the left. unkx80: I think it is fine for White. 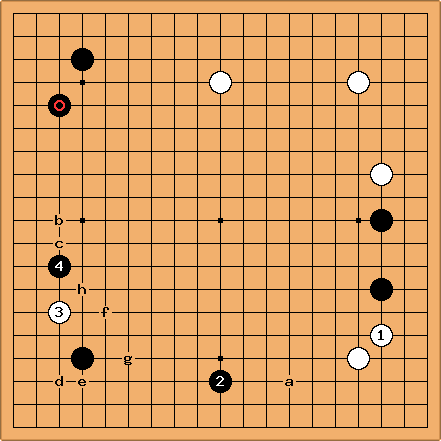 Since the two Black stones on the right is quite weak, perhaps can be played at a instead. But the game went like this. Black's peep is probably not good, but I'm not sure as white I got a good result out of this. Does white need to block at a? To be honest I never like the variation because I always think it's dubious that white can utilize the influence. In this case I think maybe spoils it a bit. unkx80: Of course White must block at a after , otherwise Black at a splits White into two weak groups. Although it is hard to quantify how White can use the influence, you should note that the Black stones on the left side is low, and the gain in territory is like 10 points or a bit more. However, or might play at a for a complicated fight, I'll tenuki from this discussion for now (3 am local time). ChrisSchack: I've always been bothered by in this position ... is connecting really the best move? Dieter: If White can now play at a, Ithe virtue of connecting becomes apparent. The thing is: what if Black does not flee with 10?